"How does he sit like that?" "Coach K" will be entering his 26th season with the Sellersville Belles in the 2018-2019 season. 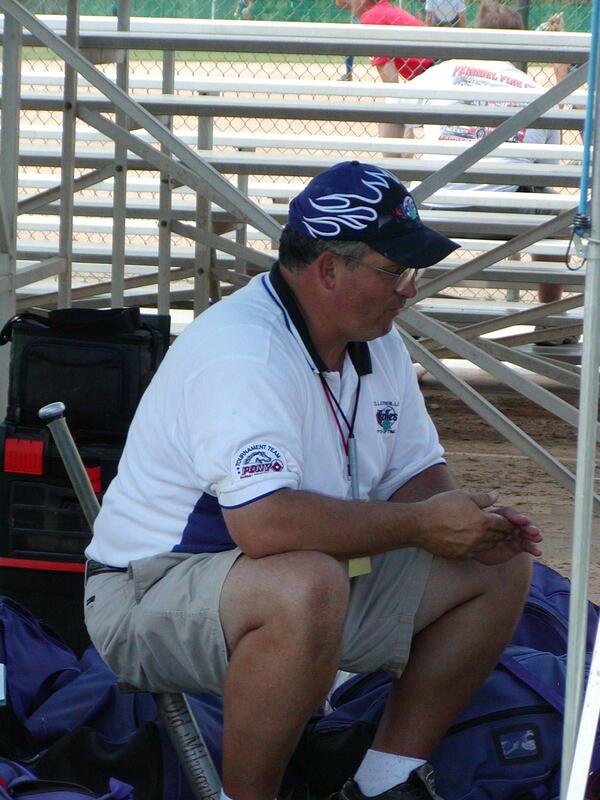 He and his wife Debbie started the Sellersville Belles 25 years ago as a 16 and Under team. He coached the Belles a total of 5 years at 16 & Under and 20 years at the 18 & Under level. The 2019 season will be an exciting one as it will be the first year with a new associate head coach, Kelsey Detweiler. This will move Coach K into the position as General Manager. Coach K takes on almost all of the responsibilities of running the Belles, from organizing and lining up fields and gyms, to ordering equipment and uniforms, to organizing the two tournaments that the Belles host each year, to trying to handle the pitching staff. This season will also involve the transition to Coach KD running all onfield activities for the Belles. A great group of assistant coaches will also help him in this transition. Also, Belles parents are a huge help with every aspect of running the tournaments effectively. The Belles Organization is just that, hard working parents. The Belles have always been a "family affair" with oldest daughter Andria and second child Brianna both playing successful careers as Belles. Andria was a pitcher and went on to have a successful career as a pitcher at Rutgers University in New Brunswick, NJ. Brianna played catcher for her career as a Belle and in high school. Son Cameron served several years with the Belles as "Bat Guy." Now the Koehler Family has added another chapter, when daughter Andria and her husband Galen will adopt a newborn baby girl at the end of August 2018, giving Coach K his third grandaughter!! This soon to be gift from God will join her cousins Sailor and Surry!! Who knows, maybe a future pitcher or catcher!?!? Right now, Surrey tends to want to throw things with her left hand - a left handed pitcher?!?! Time will tell. Coach K also has a great grandson Knox Braddock, brother to Surrey and Sailor. Coach K has a passion for the game of fastpitch. "I think it is an amazing game and I am always amazed by the young ladies who play this game. They make it look so easy. My coaching philosophy is that we need to insist on working the fundamentals and teaching the game the way it should be played. The thing I always try to keep in focus is that softball is still a game, and therefore it must be enjoyed. So if we teach fundamentals and have fun, winning will take care of itself."